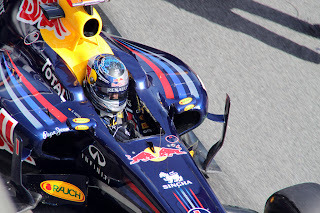 Yet another great F1 race took place on Sunday in Spain. But rather than being a manic overtaking-fest as in previous races this year, at the front this was a more subtle, tight and tense battle in the old style. And no bad thing for that. Vettel all the way to the flag, showing every intention of finding a way by. In the end he didn't quite manage it and Seb did win, which is his fourth win from five this year, but the performance of Lewis and McLaren at a circuit that was supposed to be Red Bull country bodes well for their future endeavours. And further down the field there was plenty of action as well, with no fewer than 90 overtakes in the race. Compare this with a grand total of two in the Barcelona race in 2009. But Seb drove a great race at Barcelona as well. A year older and with the assurance of winning a world championship, he's improved even from his title-winning performance of last year. The wins from the front were already being done to a nicety, but he appears to now be performing better in areas that were considered to be his weaknesses, and this was shown in Spain. He kept a cool head when led by Alonso early on, was clean and decisive overtaking traffic in the pit stop phase (passing three cars in a single lap at one point) and then utterly flawless when being stalked by Lewis in the latter stages (and without KERS). Seb continues to answer all of the questions posed to him in 2011. And the next race is Monaco - and who'd bet against Seb answering another question in the affirmative there? Not for the first time this year, the Red Bull pace advantage didn't translate from its qualifying entirety to race day. This, according to this very good Mark Hughes analysis, may be a combination of Red Bulls being relatively unkind on its Pirelli tyres over a race stint, that Red Bull appear able to use their DRS more often and to greater advantage, which of course can be used to gay abandon in qualifying, as well as possibly a better off throttle exhaust blowing of the diffuser than that of their rivals which has to be used sparingly the race (as well as persistently duff KERS). Mark Webber's pole advantage faded to nothing on Sunday afternoon. He was stuck behind Alonso's Ferrari for much of the way, and employed a less than optimum strategy to try to get around him, which kind of spoiled his day. He eventually placed a distant fourth. You have to ask now where Webber can get one over his team mate if not here at Barcelona, where he's considered a specialist. Jenson Button, by contrast, showed the value of sticking to a 'big picture' strategy that paid little mind to covering off track position, employing a three-stopper (one fewer than those around him) to come in third, having been bumped down to tenth on the first lap. Another learning point for many in this 'new' formula. Fernando Alonso pleased the home crowd, and many more of us besides, with a spectacular charge down the inside of both Red Bulls into the first corner to lead from the start (wasn't it also great to hear the crowd's cheers over the noise of the engines?). He also stayed there defiantly for 19 laps (dare I say it was Gilles Villeneuve-esque?) before he was leapfrogged and outsmarted on strategy to come home a lapped fifth. In a vain attempt to stay ahead of the chasing pack (and having been hoodwinked by Red Bull into making their fourth stop ahead of time) his stops were much earlier than the optimum, meaning a go-slow on the made-of-wood prime tyres for more than half the race (37 of the 66 laps). Indeed, these new harder Pirellis seemed particularly useless when bolted to a Ferrari, certainly compared to how they performed on the McLaren and Red Bull. Still, given the Ferrari's general competitiveness at the Barcelona track (their technical upgrade was a bit iffy in Spain) fifth place was the best Alonso could have hoped for reasonably. The next three tracks (Monaco, Canada and Valencia) will suit them better, as seen by the car's strong acceleration and top speed at Spain, but their championship hopes look increasingly fanciful unless they find pace quickly. slipped back from their early-season glories - and their drivers gave a further slant on the increasing futility of qualifying theory. Petrov went for it in qually, and started in sixth, but with relatively few fresh tyres on Sunday fell back to finish eleventh. Heidfeld couldn't take part in qualifying due to fire damage to his chassis sustained in free practice and, having started last but with a full compliment of soft tyres, came through the field on race day to finish eighth. Hopefully enough alarm bells will now ring at the FIA to tweak the tyre allocations to incentivise serious efforts in qualifying. Otherwise there's a real risk of most or all of the field electing not to run to their ultimate pace (or hardly run at all) in qualifying, instead preferring to save their soft tyres for race day. Schumi and the Force Indias did exactly that in Spain. And well done to Sergio Perez, who recorded a timely ninth place, just at the point that his strong run on his debut in Melbourne was threatening to become a distant memory. But not for the first time in 2011, F1 was the winner in Spain, further vindication of the new rules in force this year. If not even Barcelona can give us a dull Sunday afternoon it's difficult to see where will.